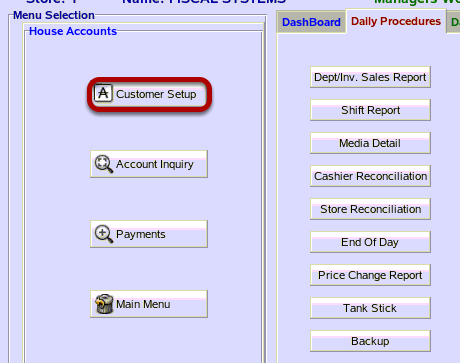 TravStar1 Point Of Sale SystemManager's Work Station House Account ManagementHow Do I Add a House Account? How Do I Add a House Account? This lesson will teach you how to add a new house account. From the Customer File Setup screen, click on the "Add" button. 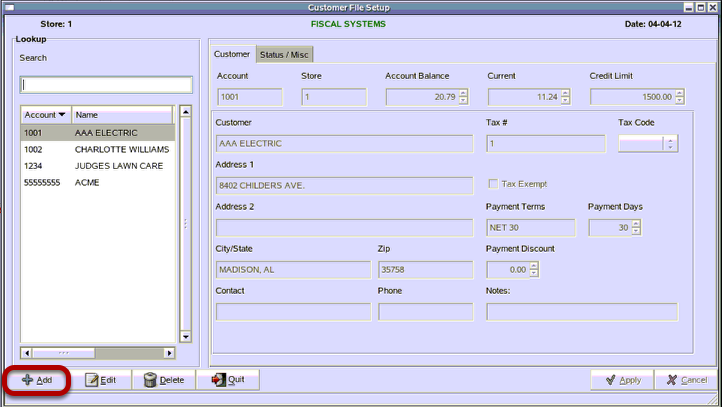 (1) From the Add Customer screen, type in a customer account number. This number can be up to 8 digits long. Type in all necessary customer information. 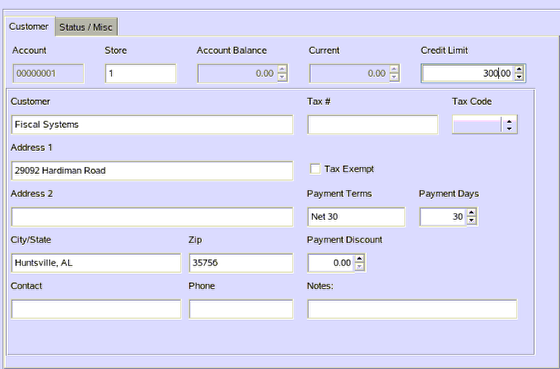 The essential fields on the Customer screen are: Customer Account Number, Customer Name, and Credit Limit. However, the only required field is the Customer Account number. (Many fields are self-explanatory.) 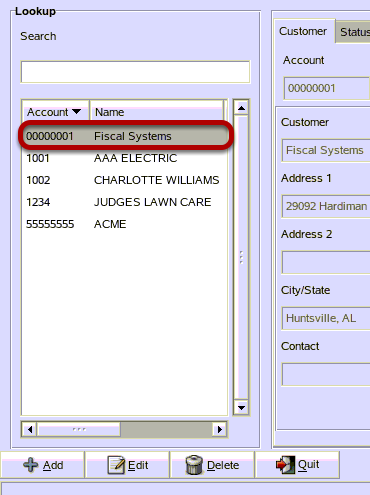 For additional information on these fields, please see What are House Account Customer File Fields? Then, click on the Status / Misc tab. (1) The data for this customer on the left side of the screen under Status will be accumulated by the system throughout the months and year and requires no entry from the customer. (2) The right side of the screen contains some fields that will not be relevant for all customers. For all fields, see What Are House Account Customer File Fields? The entries that are shown here are necessary if this customer receives statements. Notice your new customer now shows up in the lookup menu. In order for this house account to be usable the house account file must be sent down to the register. 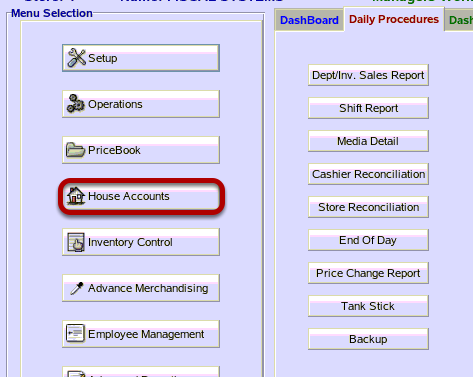 For additional information please see How Do I Send House Accounts (Customers) To The Registers? 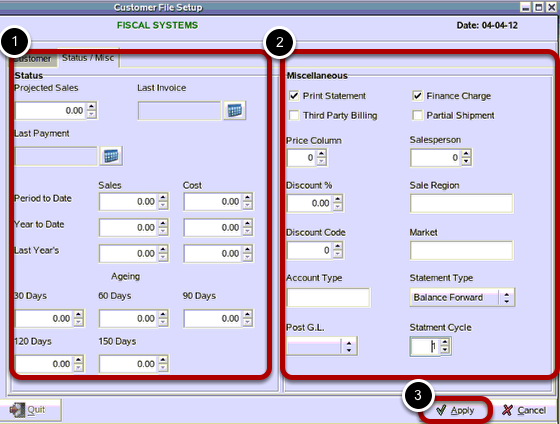 Prev: How Do I Receive an EDI Invoice? Next: How Do I Edit an Existing House Account?